Come and join us in a magnificent fiber and yarn club experience. 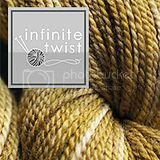 Registration is open for the following clubs: The Sock Hop Yarn Club offers hand dyed and hand spun superwash merino yarn with patterns from Lisa Ellis Designs. Gigi is in love with tweed! Gigi scored some Jo Sharp felted tweed DK at the yarn swap. We talk about the yarn swap, and Gigi's failed Swan Purse. Gigi has cast on the Odelia sweater (by CocoKnits). Jasmin has been working on her Mariah cardigan. Gigi is working on the Ophidian shawlette by Sivia Harding, out of Temptation. Call and leave us a message on our Google voice number! (Please don't post the number outside of Ravelry.) We LOVE the Chiao-goo lace needles (which you can get from Bobbin's Nest Studio). Jasmin has cast on a Baby Surprise Jacket, and mentions being on the latest episode of Brass Needles (where we discuss Mega Piranha). Jasmin has finished "Knitting Without Tears". Gigi has been reading "How to Knit a Heart Back Home", and they both re-read "How to Knit a Love Song." - February 17-20: Stitches West in Santa Clara, CA. We talk about knitting a miniature version first. Gigi's slipped first stitch attacks her Odelia. Jasmin has decided to undo her Elemental Pullover. Gigi is attacked by yarn that is too busy for the Cookie A BFF socks. Jasmin tries to outsmart Elizabeth Zimmerman's Baby Surprise Jacket. This week, we review The Big Book of Knitted Monsters by Rebecca Danger. WE LOVE IT!!! This week, Jasmin reviews the Hansen MiniSpinner. It's versatile, small, and light. It can spin *literally* anything. It's not a silent wheel, but it's not loud either. 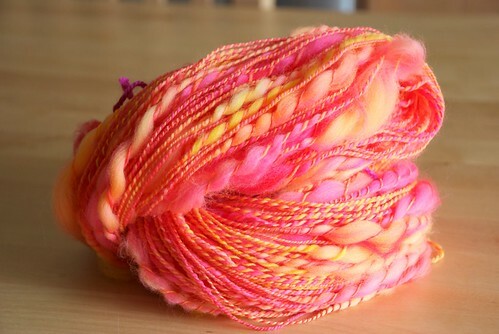 Jasmin really liked it, and will buy one if she decides to spin more bulky or novelty yarns. Jasmin mentions Jacey Boggs' Sit and Spin DVD. Jasmin has started spinning for Andrew's 10-year sweater. The pattern is the Baseball Jersey from "Knits Men Want". Jasmin is spinning the body of the sweater out of a Romney/Rambouillet cross (from Harold Goodnow, which she bought at Rhinebeck 2009), and it is amazing to spin. Loved the show. Mariah was my first knitty pattern and Jodi was awesome with my questions.I met Sivia at a lace retreat when she launched the Ophidian. It is as lovely as she is. Your podcast is as informative as it is fun. Another great podcast! But you must stop giving such great book reviews, as I keep buying all of the books! This monster book by Rebecca Danger is so adorable and the monsters appear to be so doable! The book arrived on Tuesday and I took it to share with my knitting group on Wednesday - now everyone is buying her own copy! Too bad you don't get a commission!